The New Team Polo combines the stylish and popular clothing style of New Team with an easy-to-wear casual style. 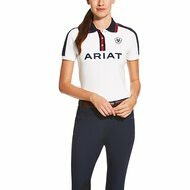 Made from performance stretch material and equipped with Ariat's Moisture Movement Technology ™, this is a technically designed sports top that is perfect for riding and an active lifestyle. 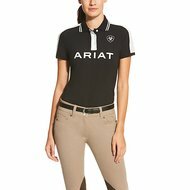 Color checkered shoulder panels, logo buttons, embroidery and a flat knit rib collar make it comfortable and stylish for in and out of the saddle. Polo elegant and breathable, size very well however I find it quite expensive that is half justified on the quality and material of the product! I still made a little crazy by buying this polo! Great T-shirt, really by far my favorite. He stays well in the wash, he fits super well, he breathes well (despite the fact that the fabric is quite thick). I am a fan. It costs a lot, but you get a lot in return! Good fit, size is right. 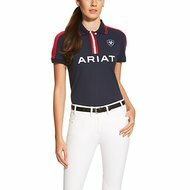 Is as I am used to from Ariat. Very fast and perfect delivery. Good fit.